What exactly are simple machines? How do they work? And how do you make learning simple machines easy for your children? Learning simple machines can be accomplished by using common examples to help your child comprehend these basic scientific concepts. Hand tools, silverware, even parts of the human body can all be considered simple physical machines. Any physical machine makes work easier to accomplish. To a scientist, work is the amount of force (a push or a pull) used along the distance upon which the force acts, or the product of force and distance. For work to be done in a scientific sense, the object must move in the same direction in which the force acts. As you carry a heavy stack of books across the room, you do not do work on the books, since motion and force act in different directions. The motion is in the horizontal direction, along the floor, while the force is straight up, acting against the weight of the books. When you lift the stack of books straight up, you do work on the books, since the applied force and the direction of motion are the same. If you carry the books up or down a flight of stairs, then you do work on the books along the height of the stairs. Simple, physical machines make work easier by multiplying either the force on the object or the distance involved. A see saw does work on the people sitting on either end. Have you ever changed your position on one end of a see saw to allow a small child sitting on the other end to go up and down? You adjusted one part of a lever to allow it to do work, that is, to lift up the people on each side easier. Learning simple machines is as easy as you and your child experimenting with this concept using a ruler, a pencil, and a few coins. Place the ruler across the pencil at a right angle to the pencil and at the middle of the ruler. Place one coin after another on alternating ends of the ruler and at different distances from the pencil until the ruler balances on the pencil. What do you notice about the types of coins you use? How far away are the coins from the pencil? How many coins do you place on each side of the ruler? Depending upon your reference, simple machines can be classified into many categories, but the two basic groupings are levers and inclined planes. A lever has two sections, or lever arms, which move around a fixed point called a fulcrum. Levers may include an automobile jack, wheelbarrow, see saw, broom, shovel, or a human’s forearm. An Inclined plane is a ramp or slanted surface along which a force moves an object to different elevations. Two inclined planes placed back to back, form a wedge that is used to split things apart. Inclined planes include staircases, screws, mountain roads, and a human’s front teeth. Most ordinary hand tools are composed of simple, physical machines. A pen or a pencil is a lever. A door knob that turns is a lever, both for pulling or pushing the door and the door knob itself. A nut cracker is a lever. A wall light switch is a lever. A crowbar is a lever. The length of a nail is a lever, while its pointed tip is an inclined plane. The length of a table knife is a lever and its blade is an inclined plane. A fork is a lever and so is a spoon. The tines on most forks end in points, therefore they are inclined planes. A hand-operated pencil sharpener is a combination of levers and inclined planes. Examine a pair of scissors closely. Can you find these simple machines? The lengths of the blades and handles are levers. The tiny post the levers turn around is a wheel and axel and also a lever. The blades are inclined planes. One edge of each blade is narrower than the other, forming a miniature ramp. By identifying these common items children are learning simple machines without even realizing it. You can use every day examples to aid your children in learning simple machines. They can help explain what simple machines are and how they function. With practice children can distinguish physical objects as simple machines and determine how they operate. Simple physical machines can be located in the kitchen, in the garage, in the toolbox, and even in the human body. Lorie Moffat has 20 years of teaching experience in both public school classroom and science museum settings. Contact her about special summer online tutoring packages. Your child comes home with questions about the different kinds of kinetic energy. So how do you distinguish between the many different types? You can use common examples to help your child understand the kinds of kinetic energy. Kinetic energy, or the energy of motion, is the ability to do work. If you use a force across a distance, you do work in a scientific sense. If you slide a book across a table, you have used kinetic energy. The many kinds of kinetic energy include mechanical, electrical, radiant, and sound. Four Kinds of Kinetic Energy #1- Mechanical kinetic energy is the most familiar and common example of kinetic energy. As an object moves, it has kinetic energy. In order to lift an orange over your head it takes a joule of work. Kinetic energy is measured in joules (rhymes with cool) or Newton-meters, with force measured in Newtons and distance measured in meters. A car accelerating at the same rate as a bicycle has more kinetic energy because it has more mass. Four Kinds of Kinetic Energy #2– Electrical energy that moves through wires is measured in watts. A joule of work done in one second is a watt, which is named for James Watt, the inventor of the steam engine. Trains used to run using steam engines. If you lift a quarter-pound hamburger with cheese vertically, a distance of one meter in one second, you use a watt of power. Take a close look at a light bulb that is not in a lamp. You will see a number followed by “kw”, or kilowatts, on most light bulbs. Electric motors also have kilowatt ratings. A kilowatt is one thousand watts. Electrical power can also be described as the product of current, measured in amperes or amps, and potential, measured in volts. Four Kinds of Kinetic Energy #3- Solar energy is the heat and light, or radiant energy produced by the sun. The sun does not burn like a fire does. Nuclear fusion creates the sun’s energy. Helium atoms are formed from lighter hydrogen atoms, in the process creating heat, light, and other particles. Light energy is a form of radiant energy emitted by accelerating electric charges or the electrons of atoms. Light we see, or visible light, is a small portion of electromagnetic waves, which are partly electric and partly magnetic. Light moves through the vacuum of space or through a material as waves. A wave can be described as a back and forth motion or a vibration. Light can also move as particles, or photons. Frequency measures how many complete vibrations occur in a given time period, usually a second. Hertz is the unit for frequency, named from Heinrick Hertz who demonstrated radio waves, a type of electromagnetic radiation in 1886. Electromagnetic waves range from the longest, radio waves, to the shortest, gamma rays. The lowest frequency of light that we can see is red and the highest is violet. AM radio waves are broadcast in thousands of hertz, or kilohertz. FM radio waves are broadcast in millions of hertz, or megahertz. Radar and microwave ovens operate in the gigahertz, or billions of hertz range. X-rays and even shorter gamma rays are used in chemotherapy. In a vacuum, all electromagnetic waves travel at the speed of light which is 300,000 km/s. Heat energy is another form of radiant energy. If you have ever seen a shimmering effect above a paved road or parking lot on a hot day, you have seen heat waves. You can feel heat radiating from a candle flame, a fireplace, or a space heater. Most light bulbs heat up while they operate because the tiny wire inside each bulb, called the filament, heats up and glows. Four Kinds of Kinetic Energy #4- Acoustic, or sound, energy begins with the vibration of an object. A guitar has strings that vibrate to produce sound. A clarinet has a vibrating reed while a trumpet has a vibrating column of air in the mouthpiece. The human voice has vocal chords. These vibrations start waves in the air. However, sound also needs something to move through, or a medium. There is no sound in outer space since there is nothing for it to travel through. Astronauts outside the space shuttle or the International Space Station use radio waves, a form of electromagnetic radiation, to communicate. You can use common examples to explain the various kinds of kinetic energy to your child. The many forms of kinetic energy include mechanical, electrical, radiant (heat and light), and sound. 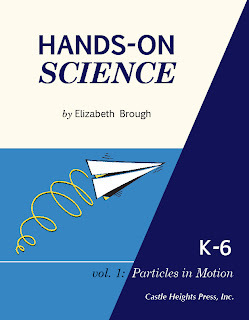 My favorite activity in the book is The Molecule Game, which the author, Liz Brough, has introduced throughout the text to demonstrate concepts from molecular motion to erosion. Basically it is a bunch of kids running around the room in organized chaos under guided instructions to demonstrate a point. Children careen off the walls with instructions like “heat up!” and “cool down!”. Folks, its 200 pages of experiments and activities that use everyday materials you already have around the house such as bricks, ping pong balls, balloons, modeling clay, and jars. And I need 3 bloggers to review the new book! Do you think you would be a good candidate? Do you have children being homeschooled in the K-6 grades? I need someone who can set aside time enough to do 4 or 5 experiments at least throughout the book in order to provide a review by May 30th. Think about it, because I know we’re all busy with the school year! Leave a comment stating why you think you’d be the blogger to review Hands-On Science. Head over to the Castle Heights Press store website to look at the product listing. You can follow Homeschool Science on twitter and facebook if you like, but that’s not how I’ll be selecting the reviewing bloggers.